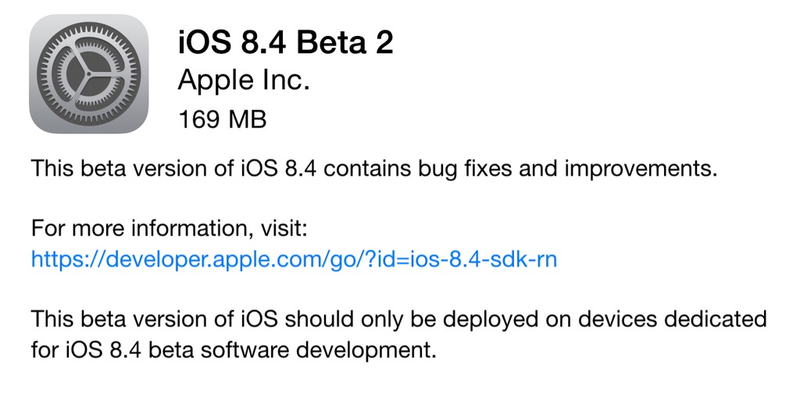 Apple has seeded the second beta of iOS 8.4 to developers. The second beta comes exactly two weeks after the release of the first beta. Apple introduced a brand new interface for the Music app in the first beta and the second beta continues to improve on that. It also brings a few new features along with bug fixes and performance improvements. The iOS 8.4 beta 2 carries the build number 12H4086d and is currently available for download via the OTA feature on your phone. You could also download the beta from Apple’s developer portal. If you signed for Apple’s public beta program, you can also download the new iOS 8.4 beta 2. According to the release notes, Apple has fixed several issues pertaining to CarPlay, App Store and Mfi GPS. Music app crashes when connected to CarPlay. App Store: Search is not available on iPad. MFi GPS: Addresses an issue where location information was not read from some MFi GPS accessories. In beta 2, iTunes Radio on the Music app will automatically suggest you trending searches when you search for a song. Since this is a beta, you will no doubt face some issues. For example, AirPlay streaming will not work in beta 2 and the Music app may behave improperly during playback. Alongside iOS 8.4 beta 2, Apple has also seeded Xcode 6.4 beta 2 and OS X 10.10.4 beta 2. Let us know if you find something new in the latest iOS 8.4 beta.